Imagine if you could travel back in time to Hawaii before mass commercialization? This is kind of what Pangkor reminded me of. Getting here is not easy, there are no nearby airports and we took a 3 1/2 (which ended up being 6) hour bus from the Malaysian mega-city, Kuala Lumpur to get there. The 30 minute ferry ride was one of those moments where you ask yourself, "so this is how i die?" The ferry was in rough shape - like it had been decommissioned 30+ years ago.. yet somehow got a second life here. At the ferry's initial stop, we had no clue if we had reached our destination - and people were quickly piling off the boat. Pat (my step dad) stood up and someone quickly said to him as he walked by - "Next stop." with a smirk. It's the one time where being a clear tourist comes in handy! After getting off our stop - we quickly realized that here on Pangkor there is only 1 cab service and they are ALL pink vans! What a trip. We quickly piled in all of our crap and off we went to our hotel. Checking in we hit our first snag; they couldn't find our reservation and also appeared to be fully booked. We later found out that the person that had made the reservation for us had been fired. "So what are we suppose to do?" The front staff gave us 2 options. Option 1: Stay in their massage room (no b.s.! ); Option 2: Stay at the next hotel over. Before making a final decision, we opted to view both options (Thank God). The next hotel had the most disgusting rooms we had ever seen! We're talking torn, dirty sheets and the works! Oh, and the massage room...IT WAS A MASSAGE ROOM! Who knows what had gone on in there over the years and the strong scent of massage oils was enough to give anyone a headache. So, we chose Option 3. My fast thinking Estelle asked the front desk about Pat's room setup and as it turned out he had an extra bed - so we had a little slumber party that first night! The main town of Pangkor is very small; and there were very few tourists and most the tourists were Malaysians. There were only 4 or 5 restaurants and it was more street food style - you wont find any nice restaurants here! If you come here - you are coming for the beach - Coral Bay Beach. And so, that is what we did! We walked the 5 minutes everyday and just relaxed on the beach. Sitting on the makeshift hammocks made out of fishing nets; read, swam and just hung out. We had noticed a sign at our little hotel that read "Karaoke 9pm" and I knew we had to "get involved"! Back in my hey day - I may have been known to bring my own karaoke machine to house parties, holiday events, and the works - but it had been some time since my last singing session! That night we came back and it was 100% the staff; and they were primarily singing Malaysian classics but were mixing in some Top 40 songs. They warmly greeted us - so, we all put some songs in and represented with some Classics from the US of A. I had to bring out my go to..."Sweet Caroline" and felt pretty good about it. I put in YMCA for Pat and when they called him up on stage - the crowd went wild (especially 2 male members of the staff) when he ripped his shirt off - holy cow! He quickly got VIP status - since he also dominated the dance floor with his "unique" Bollywood dance interpretation ;) All in all - so epic and such a fun night! On our second full day we decided to rent kayaks and venture to a small island not too far from Coral Bay. While heading back from the island, we got stuck in a tropical rain storm! The most ominous dark clouds emerged out of nowhere, and soon engulfed us and delivered torrential rains and powerful gusts of wind. So, we may have all panicked and then rowed as if our lives depended on it (which it kind of did) to the shore. We made it back safe and sound and no one; no one else could be found on the beach! So after docking our kayaks - we of course had to go for a nice little dip in the ocean with this ridiculously heavy rainfall - but something about it made you feel so very alive! We loved it! Almost as soon as it had arrived; the storm passed and that's when we decided to join Pat and Elise on their jungle tour. It seemed like a good idea at the time but soon after entering the forest; and navigating barely recognizable trails, Estelle and I were swarmed by mosquitoes and got a little freaked out since we weren't taking our anti-malarial meds. So, we respectfully declined to go any further and got the heck out of there! Soon after Estelle, noticed she had a LEACH and panically wiped it off - then I looked down and noticed that I too HAD A LEECH and REALLY freaked out! Feeling itchy and disgusted - we then turn to see a pack of wild dogs barking at us from a distance and we retreated as fast as we could back to our hotel for a shower and to regroup! One of the things I liked about Pangkor was the wildlife. We had these amazing Hornbill birds that have these magnificent beaks and then of course the monkeys! They are the ones that really run the island and you could see them EVERYWHERE! In the hotels, jungles, crossing the powerlines over the road - so cool .. yet scary! Since its obvious how strong and swift they are. Arriving as strangers - leaving as karaoke / dance party friends; we left Pangkor with some new friends at Nippah Bay Valley Resort...Until next time my friends! Kurt informed me a few weeks ago that I was "booked" from July 16th to the 18th. What we were doing or where we were going? I had no idea. I'm not even sure if Kurt had any idea ;) In traditional Indonesian style, Kurt and I were stopped by the Balinese police on the way to my "surprise destination". You see, Kurt and I have been riding scooters for quite some time now. 36 days to be exact. We don't exactly know the "rules" but figure that we'll learn them as we go. We were informed by our taxi driver that we can go and "purchase" a license at any time. Yes, we can just pay the $20 and have someone deliver us legitimate motorcycle licenses. I'm not really sure what legitimate means anymore. This was Kurt's first encounter with the Polizia! We were pulled aside, given notice as to which laws we had broken and had to either pay the penalties on the spot or be taken to the station. Lucky for us, we were riding with backpacks and so our "we-are-poor-backpackers" story was believable and we were set free with minimum charges! The resort that Kurt picked for us was INCREDIBLE. SO incredible that he wasn't even sure if we had come to the right place! I kept saying "I won't get excited until the receptionist tells us we have a reservation." The second she said "Mr.Hynes?" I squealed! The compound boasts 500 pools (or maybe just a really large number) and lagoons everywhere. Our room was stunning. I love that Kurt and I feel the same way in that we don't want to stay at these types of places often. We love that when we do come, it's exciting and a real treat. We don't want to ever take moments like these for granted. I woke up on July 17th next to the man I love aaaaand from the phone ringing at 7 AM. I knew it could only be one of two people. My sister Danielle or my sister Riani. Kurt picked up the phone and I could hear her voice through the earpiece. :) Danielle had found me and wanted to know if she and Riani could buy us an extra night at the resort. The great thing about having international ninjas as sisters? They can find you on your birthday no matter where you are! AND they are willing to buy you an extra night and have your room upgraded to an Execute Suite. I really can't complain - I live the good life. Thanks guys! I had an amazing birthday. I played ping-pong, I swam in the Indian Ocean, I video conferenced with some close girlfriends, I spoke to my sisters, I ate the most delicious ice-cream bar, I received so many wishes from friends and family and I nourished my body with a healthy meal for dinner with great people. I was able to speak with my mom - and that in itself is such a blessing. Hearing her voice and laugh brings me so much genuine happiness. I can be half way across the world from her and share a moment - how wonderful is that? I went to the gym TWICE - that to me is a luxury and the greatest gift I could give my body! Thanks to Kurt for playing Personal Trainer for me! Birthdays are always a good time to reflect. What have I accomplished in the past year? Have I changed in any ultimate way? Do I live the life I want for myself? In my 26th year of life, I traveled to Jakarta, Vancouver, New York, Boston, Cape Cod, Maui, Kauai, L.A, Portland, Singapore, Hong-Kong, Malaysia and Bali. I jumped out of a plane the day I turned 26 and have been flying ever since! I moved across the world with a great guy, gained a wealth of experience from an unconventional job and found a sport that I am more passionate about than anything else I have ever encountered. How powerful are we, that we can decide at any given moment how we want to react to any situation. If I want to be happy all the time - no matter the circumstance - I can choose that. I am not saying that I am able to do that - but how powerful is that? My resolution for this 27th year is to practice embracing all moments - even the bad. That way, all the good ones will be that much sweeter. To another year! I pray that I will continue to appreciate the simple things in life, to keep those that I love close and to make a positive impact in whatever way I can. Life is short and I tell Kurt that I don't want to ever wish I lived in the movies. I want my life to be my own movie. To my sweet, sweet Kurt. I love you. Thank you for slow dancing with me at a restaurant where the dance floor was empty. You make me feel like a princess every day and that is more than I could ever ask for. The great thing about being a TCK (third culture kid - google it, its a real term ) is that you have friends and family all around the world. International borders are merely traffic lights at an intersection. Those of you who know the Townshend-Sisters, know that once we are in your lives - we never leave. Fortunately or unfortunately (depends on how you look at it!) for the Ishak family - they have been stuck with us for almost a decade! My sisters and I don't call these two Malay parents of ours by their first names. They are simply Ma (mom) and Ayah (dad). Within the years that the three of us have ventured on our own journeys, these two and their children (Iman, Ashraf & Jo) have welcomed us into their home. Some of the most hospitable and genuinely caring people I know, Ma and Ayah have always treated us like their own daughters. As soon as I let them know that Kurt and I were flying into Singapore, they insisted that they pick us up. This doesn't seem like it is a grand gesture until I tell you that they live in another country, 5 hours away. "Ayah what car will you be driving?" I texted him earlier in the day as we made arrangements to meet later that evening. This is a valid and important question to ask - as Ayah has TEN vehicles. We were informed that he would be driving his black BMW 7 series - Plate number : ADS13. Kurt and I look around the Hyatt lobby for a black BMW. Nothing. I turn around to see Ma waving her hand out of a silver BMW 3 series! So much for ADS13! First things first - those precious three words we all long to hear from our parents "Have you eaten?" We make our way to Arab street where we befriend the owner of the restaurant, a Lebanese man who happens to live in a border town in Malaysia, Johor Baru (where we were headed). The story of how we ended up at this restaurant is for another day but let me just say that being PALEO in Asia - is not easy. We ask our new friend how he manages to avoid the traffic at the border crossing and we learn that he feeds all the traffic cops at his restaurant and therefor speeds down the bus lane without ever having a problem! Since we were obviously now family, he invited us to follow him in his "express lane". "Soooooo... " Kurt looks over at me once we have reached Ma's fathers house in JB (Johor Baru). It is much more enjoyable to split the drive to KL in half by staying the night in JB. I had informed Kurt ahead of time that we would be sleeping in separate rooms to respect the religious beliefs of Ma's parents. Kurt stands in the the hallway big-eyed and patiently waiting to hear which couch was his for the night. Ma, then surprises us by looking at both of us and says "this is your room". Confused and sure that she has misspoken, we stand there awkwardly until we realize that she meant to put us in the same room. Still unwilling to accidently offend anyone, we wait for Ayah to come in from outside to triple check! "Ayah? Are we staying in the same room?" I mutter under my breath. There is a mini-debate that occurs between Ma and Ayah and they come to the consensus that it is one in the morning and everyone just wants sleep. We didn't complain! As we passed a view of the border line the next morning, we joked that we would still be there if we hadn't taken the bus route! On the drive to KL (Kuala Lumpur) Ayah insisted that he stop to pray and say hello to a friend. Tired and hungry, Kurt and I hoped that the visit with the friend wouldn't be too long. To our delight, it was a wonderful visit. The friend that he introduced us to, is a remarkable artist whom once was the resident artist of ...... Like a true artist, paint brushes were scattered around the house, paintings stacked up against the walls and art exhibition pamphlets peaked out from under water colors - an organized chaos if you will. I was inspired to hear that he prefers to stay clear from art dealers. He would rather sell his art at a lower price to someone he knows will appreciate his work and simply enjoy his art. Kurt and I were surprised to hear that he doesn't have a website and want to change that for him on our next trip back to KL! More photos of his incredible work to come! I glanced at the clock, it read noon. We had about one hour to reach the bus station where we were meeting Kurt's step dad, Pat. We had plans to take a bus to Pangkor, an island off of the west coast of Malaysia. We had agreed to meet at the station at 1PM and figured that an hour would be plenty of time . As quick as we sped down the freeway, we just as quick came to a stop. Taking into account that it was a Saturday, Ayah was sure that traffic would not be bad. In proper Asian fashion - a parade, protest or simple gathering managed to appear from nowhere in the middle of the city, causing gridlock traffic. Easy going and always uplifted, Ayah reassured us that we would get there on time. As cool and collected as Ayah is, i knew that we were running tight on time from the frequency that he checked his watch. "We're going to have to run.." Ayah says calmly as he parks the car on the side of the freeway. "What?" Kurt and i look at each other wondering if he is serious. As Ayah gets out of the car, holding his tablet (something he is rarely without) we understand that he is serious! Dodging cars and trying to keep up with Ayah, Kurt and i run through downtown KL. As Kurt had not seen any of the downtown area before, Ayah ran and pointed out different parts of the city! "And that is China town!" he would yell back to us as he waved his hand towards an area we passed. With literally FIVE minutes to spare - we reach the station and find Pat. Excited to see Kurt's step dad half way across the road - we are SO thankful to have had Ayah with us that day. I feel very fortunate to have introduced Kurt to my Malaysian family. As i could only imagine, Kurt fell in love with Ma and Ayah. I thank my lucky stars for blessing me with so many wonderful people in my life. If wealth was measured by love, i would be a billionaire. This photo says it all! 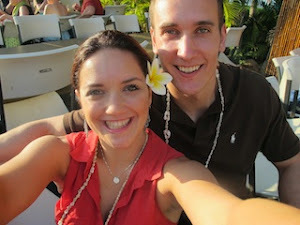 We embark on our first "Visa Run" and adventure from Bali! It really doesn't seem all that long ago that we first arrived in Bali and here we go; off to the next adventure! I have been out sick the past couple of days with a case of Gastritis..YUCK! I was completely out of commission, more or less bedridden for 48 hours but after getting on antibiotics, I was now feeling much better and ready to take on this 9 day trip! For the first leg of our trip, we will be in Singapore. Prior to our departure I didn't know much about Singapore - so I arrived with an open mind but had heard good things. One thing that was apparent from the beginning was that this was an extremely modern, clean, and well run airport. The immigration process was incredibly quick and efficient and before we knew it we were on the train from the airport to our hotel. With only 2 days in Singapore, Estelle and I wanted to make the most of it. While checking into our hotel we chatted up the friendly staff and came up with our game plan. We roamed the streets of Little India until we found a doctors office and found the doctor to be one of the funniest, nicest, and assertive doctors we had encountered! $10 later, yes $10 later, Estelle got her prescription. The doctor had called in her prescription and the only pharmacy in South East Asia that se could get it was...The hospital where she was born, Mt. Elizabeth Hospital. For the "right" to buy a car you need to pay $70,000 fee to the government! There are a lot of parks in Singapore - and they have full on gym equipment outdoors! So glad that we did the tour - our guide was great! He even helped me pick out some Chinese medicine for this sore throat I got! Our last day happened to fall on July 4th, so as US citizens we felt that we had to be true patriots and celebrate Independence Day. So we went to to Adventure Cove Waterpark at Sentosa! Sentosa is like Disneyland - a huge development with a Water Park, Universal Studios, Aquarium (largest in the world), and many more attractions (check it out: http://www.sentosa.com.sg/en/). The water park was a blast going on the different slides and it wasn't too crowded. We didn't have any towels but tried this lovely device (picture) and it did the trick and fully dried us! Next stop was Mt. Elizabeth Hospital to get Estelle's epipen. Once we got it; what a sense of relief! Traveling and having anaphylaxis allergy to shellfish is scary! After walking around Orchard Road (think Rodeo Drive) we were feeling the fatigue. "Want to watch a movie?" YES! We saw Lone Ranger and we both thought it was one of the best movies we had seen in a long, long time! Highly recommended. With our time in Singapore winding down - we rushed to go and meet Estelle's family friends that were coming all the way from Kuala Lumpur to come pick us up and continue our Adventure.